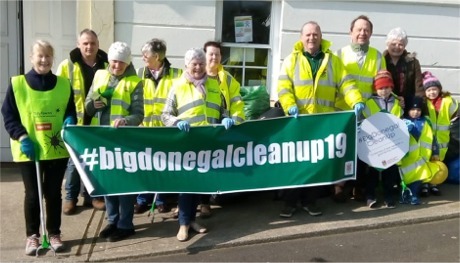 THE Big Donegal Clean Up continues this weekend across Inishowen with community clean ups planned for St. Johnston, Malin Head, Drumfries, Culdaff and Bridgend. 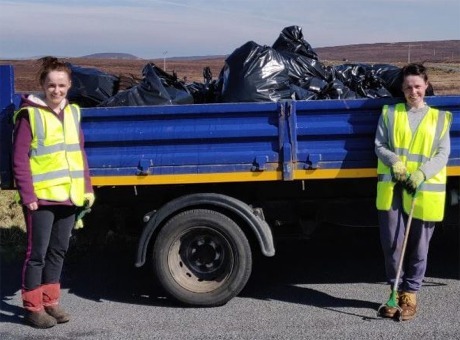 Catherina and Michelle Doherty who participated in the Inishowen Community Clean up at Mindoran, Clonmany on Saturday the 6th of April 2019. There is still plenty of time to take part in the Big Donegal Clean Up by organising a clean up in your own area. All you have to do is call the council on 074 91 53900 or call into to any council office to register. Donegal County Council provides bags, pickers and high vis vests and then collects the rubbish from designated points at agreed times. Moville / Greencastle volunteers who joined the Inishowen Community Clean up last weekend. • Big Village Clean Up by residents, businesses and community this Saturday in St Johnston. The centre will be open from 9am – 1pm with tea and coffee for all volunteers. Litter pickers, high viz jackets, black bags available in the resource centre anytime this week for all the ongoing clean ups that’s happening all week. A skip will be in place at the centre supplied by Donegal County Council. • Malin Head Youth Club are having a clean up on Saturday, meeting at the Malin Head Community Centre at 10am. There are bags, pickers etc available in the centre from now on if anyone wants to have a clean up of their area before then. • Drumfries Community Clean Up on Saturday, meeting at Slieve Sneacht Centre at 11am. • Culdaff Tidy Town clean up, meeting at the Wee Hall in Culdaff at 10.30am, refreshments in the hall after. Anyone who would like to take part in any of the clean ups mentioned can find more information on times and meeting points here .